Please welcome Damien Angelica Walters to The Qwillery. “In the Water, Underneath” will be published in GENIUS LOCI: Tales of the Spirit of Place from Ragnarok Publications. This is the first in a series of interviews with many of the authors and the artists involved in GENIUS LOCI. I hope you enjoy meeting them here at The Qwillery as much as I am! 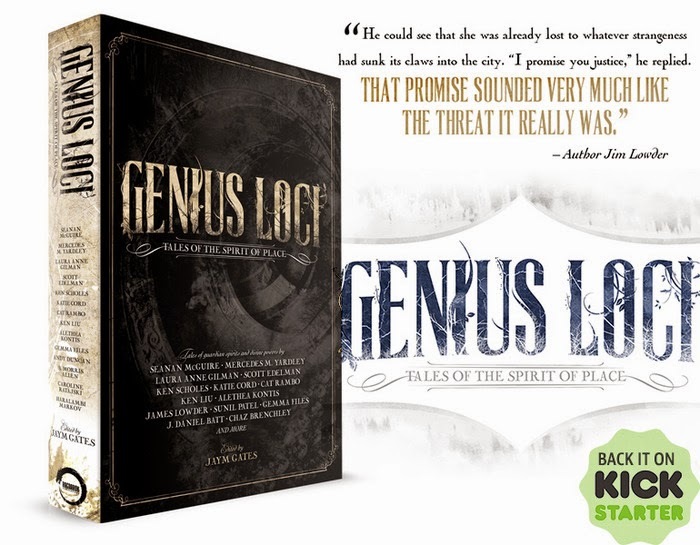 I am a backer of GENIUS LOCI which is edited by Jaym Gates. You may check out the Kickstarter here. DAW: Thank you! I prefer writing short fiction. While writing a novel allows you to spend more time with a character or group of character, short fiction allows you to experiment with form and voice and tense and points of view in ways you can’t with longer work. For a long time, I was a pantser. Over the last year or so, though, I’ve been doing more planning and more note-taking before writing, but I’m not certain if that truly qualifies me as a plotter. I suspect I’m somewhere in between. TQ: You've worked as an editor. How does this affect (or not) your writing? DAW: I think it’s helped me craft stronger stories, and it’s definitely made me a better editor of my own work. DAW: Longhand or keyboard and Word doc? I used to rely solely on the latter, from first draft to final, using Track Changes and rarely printing things out. Now I do most of my first drafts longhand and when I’m ready to do my final edits, I print the story out and attack it with my pen of doom. Said pen must be fine point and must have blue ink. TQ: Describe “In the Water, Underneath”, which will be published in Genius Loci, in 140 characters or less. DAW: Will it send you screaming if I admit that my nickname for the story is 50 Shades of the Chesapeake Bay? TQ: Tell us something about “In the Water, Underneath” that will not give away the story. DAW: It was an uncomfortable story to write because the tone and some of the language is intentionally provocative and disquieting. TQ: What was your inspiration for “In the Water, Underneath”? Have you ever encountered a Genius loci? DAW: I stumbled upon an article about the last house standing on Holland Island in the Chesapeake Bay and the accompanying photograph was haunting: a single house on a bit of land that was slowly eroding around it. I think places often have a feel, especially places that have seen turmoil or the ugliness of humankind, but I suspect it’s more that our memories and knowledge of what took place there have imbued such places with feeling rather than the place itself. That being said, large bodies of water always hold a sense of peace for me. I’m lucky to live near Annapolis in Maryland and have friends with boats, and even when the Chesapeake Bay is choppy, there’s something innately calming about it. TQ: Give us one of your favorite non-spoilery lines from “In the Water, Underneath”. DAW: I struggle to hold what’s left, but he is relentless and hungry, always hungry. TQ: In which genre or genres does “In the Water, Underneath” fit? In your opinion, are genre classifications still useful? DAW: “In the Water, Underneath” would be either dark fantasy or horror, depending on your definition of such things. I think genre classifications can be useful for readers but sometimes limiting to writers. DAW: Sing Me Your Scars, a collection of my short fiction, was just released from Apex Publications, and later this year, Paper Tigers, a novel, will be released from Dark House Press. I also have short fiction forthcoming in several anthologies and magazines, including the UK zine Black Static, Cassilda’s Song, edited by Joe Pulver, a King in Yellow anthology of all new stories written by women, and The Mammoth Book of Cthulhu: New Lovecraftian Fiction, edited by Paula Guran. DAW: Thank you very much for having me here! Damien Angelica Walters’ short fiction has appeared or is forthcoming in various anthologies and magazines, including The Year’s Best Dark Fantasy & Horror 2015, Year’s Best Weird Fiction Volume One, Nightmare, Strange Horizons, and Apex. “The Floating Girls: A Documentary,” originally published in Jamais Vu, is on the 2014 Bram Stoker Award ballot for Superior Achievement in Short Fiction. You can find her on Twitter @DamienAWalters or online at http://damienangelicawalters.com. Awesome interview! I was lucky enough to interview Damien as well, for her collection SING ME YOUR SCARS. I'm also a proud backer of GENIUS LOCI!